This section summarizes how to access the datasets produced by SMOS+Storm project as well as some data quality and information ressources. 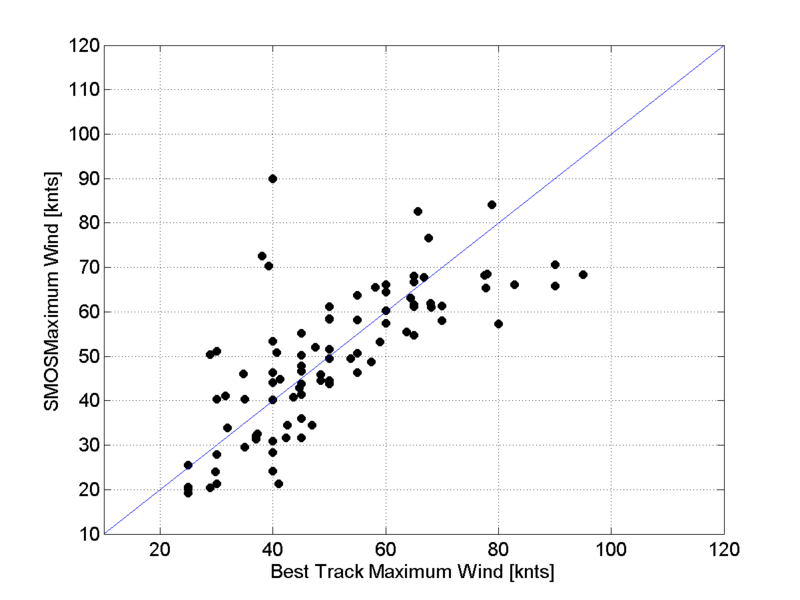 Figure 1: plot showing the SMOS maximum wind compared to Best Track reported Maximum wind speed for the North Atlantic intercepts of Hurricane season 2012. Note that this is a preliminary result as no filter has been applied on SMOS data which might include still partial Storm intercepts and RFI contaminated data. Figure 2: Maximum sustained 1 minute wind speed estimated during Haiyan Typhoon in Nov 2013. 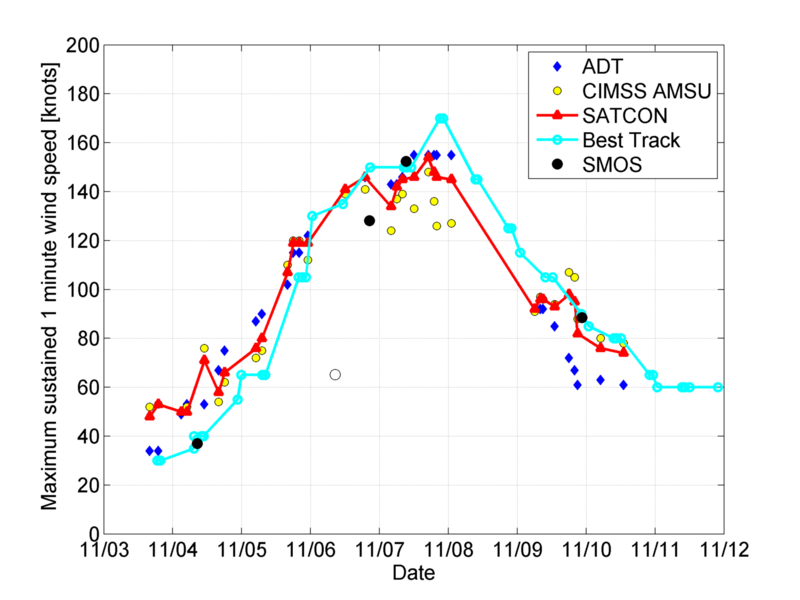 From SMOS data (black filled dots) compared to Advanced Dvorak Technique (ADT=blue diamond), CIMSS (yellow filled dots), SATCON (red) and Best Track from NHC (cyan). Note the empty circle correspond to the SMOS measurements for the 11/06 morning for which only a small portion of the cyclone signal was intercepted. Maximum 10 minutes wind speed deduced from SMOS algorithm were multiplied by 1/0.93, adopting the conversion factor proposed in (Harper et al., 2010) between one minute winds and 10 min winds. Figure 3: Median values of the surface wind speed Radii evaluated over the four Storm quadrants of Hurricane Cat 4 Igor in Sep 2010 as function of days at 34 knots (a), 50 knots (b) and 64 knots (c). Symbols for the radii from the different wind products are: GFDL model (solid black triangles), H*WIND products (gray squares), SMOS estimated winds (solid white circles) and NHC/ATCF best-track estimates (thick black curves). Note that both GFDL model and H*WIND products were spatially averaged at 50 km, the SMOS averaged spatial resolution. see [Reul et al., JGR 2012]. Figure 4: Right: location of the buoys superimposed on the SMOS retrieved wind speed for the 27th Oct at 23:05 UTC.Left: Time Series of the Surface Wind Speed measured at several meteorological buoys(black curves) of the NOAA NDBC array (National Data Buoy Center) as the Category 1 Hurricane Sandy passed between US coasts and the Bermuda Islands. Local estimates of the surface wind speed from SMOS data are illustrated by red dots. 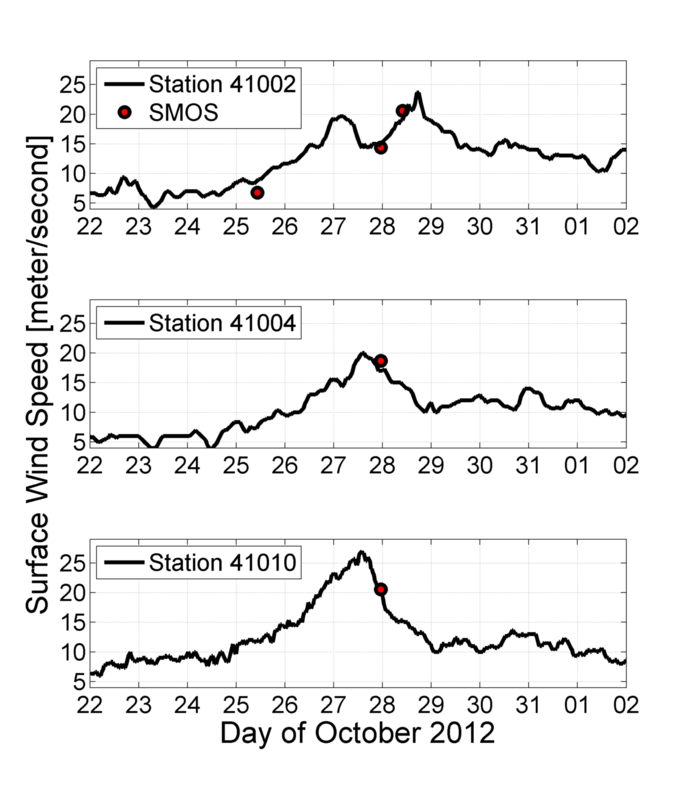 Figure 5: Top: SMOS estimated surface wind speed as the satellite overpassed Hurricane Sandy the 28th Oct 2012 at 09:56 UTC. The track of the NOAA 42 P-3 aircraft flight is superimposed (black curves). White dots indicates the aircraft location at successive times with respect to SMOS acquisition. Bottom: Co-located SFMR (black) and SMOS (red) surface wind speed estimates along the P-3 track. SFMR estimated rain rate is also shown in grey [mm/h]. Click on the images to see larger views. 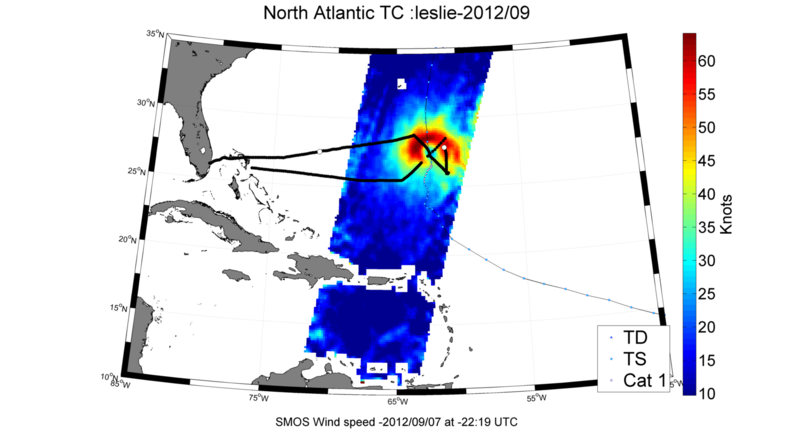 Figure 6: Top: SMOS estimated surface wind speed as the satellite overpassed Hurricane Leslie the 7th Sep 2012 at 22:19 UTC. 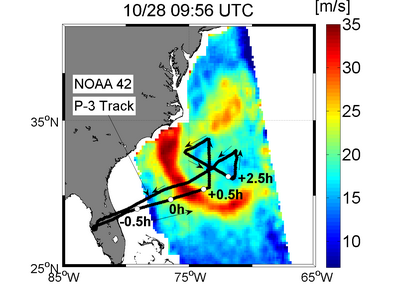 The track of the NOAA 42 P-3 aircraft flight is superimposed (black curves). White dots indicates the aircraft location at successive times with respect to SMOS acquisition. Bottom: Co-located SFMR (black) and SMOS (red) surface wind speed estimates along the P-3 track. SFMR estimated rain rate is also shown in grey [mm/h]. The Sfmr data smoothed at SMOS spatial resolution (~40 km) is shown in blue. Click on the images to see larger views.